Costs – Average costs of tree removal, maintenance and stump removal in Clearwater, Florida. FAQs – Information on trees to plant, avoid, rules and regulations, and diseases to watch for in Clearwater. Services – List of local pros that you can call TODAY in Clearwater. How Much Do Tree Services Cost in Clearwater? Whether you routinely pay for expensive landscaping or you just want your yard to look presentable, you will likely need tree services for your Clearwater, Florida, home at some point. Don’t overpay for the services you need. Here are estimates for three common tree-service costs in Clearwater, Florida. While homeowners can spend anywhere from $200 to $1,200 on tree removal in Clearwater, Florida, tree removal generally costs between $620 and $910, $760 on average. The exact amount that homeowners will pay will vary based on factors including the type of tree or shrub they need to have removed, the size and shape of the tree and the complexity of the project. Homeowners should expect to pay more for trees or shrubs with complicated root systems or that are directly under power lines. The cost to remove one large stump in Clearwater, Florida, generally ranges, on average, from $81 to $136. This amount includes between $17 and $58 for approximately two hours of labor and between $63 and $79 for equipment. The exact amount that the homeowner will pay will depend on factors including the size and shape of the stump and the difficulty of the job. Trimming and pruning services for trees and shrubs in Clearwater, Florida, can cost anywhere from $100 to $1,100. Rates of $370 to $550 are most typical, and a rate of $462 is average. Costs vary based on the size, type and location of the trees and shrubs. The experience and qualifications of the company the homeowners hire also affects cost. Florida is famous for a lot of things, and the beautiful Florida palm tree is no exception. Palm trees aren’t the only type of trees you’ll find in Florida, however. Whether you need to know the rules and regulations for tree services in Clearwater, Florida, or you are just interested in learning more about the trees that make Clearwater such a beautiful city to visit or live in, learn more about the city’s trees here. From the city to the beaches, Clearwater is absolutely beautiful, and city officials want to keep it that way. Respect the city’s beautiful landscape by refraining from chopping and planting trees as you please. Instead, get to know the city’s rules, guidelines and regulations so you can create a beautiful landscape for your home or business while still preserving the unique beauty of the city as a whole. Clearwater residents must have a tree removal permit to remove certain species of trees, though other invasive species can be removed without a problem. Completed tree removal permits should be faxed to the Clearwater Construction Service Division. The Clearwater Construction Service Division can also answer any questions residents may have about which types of trees they can remove and whether or not a permit will be necessary. Residents are free to remove their trees at any time that is convenient for them as long as they have a tree removal permit. Tree removal will generally be the easiest in the early spring or late fall when the weather is cooler. Homeowners should try to avoid mid-summer, when temperatures are soaring, as well as mid-winter, when the ground may be frozen in some areas. These conditions can make tree removal more difficult. Clearwater residents are encouraged to avoid planting tall trees near power lines and to trim trees that are growing close to the power lines. The state does periodically send out Florida Power & Light workers to trim tree branches. Florida’s state tree is the sabal palm, also known as the cabbage palm. A hardy plant, the sabal palm is wind and drought-tolerant, though the plant does best with regular light watering. 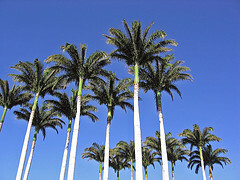 The sabal palm is widely distributed throughout Florida. 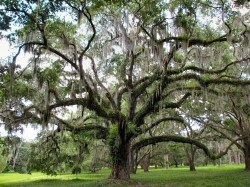 The live oak is so common in Clearwater that is was named the city’s official tree. Many types of fruit trees do well in Florida because of the warm climate and wealth of sunshine. In addition to the more common orange and lemon trees, Clearwater residents can also grow avocadoes, carambolas and mangoes. Clearwater trees are often affected by Spanish moss, Psocids and Oleander caterpillars. Of these three, only the Oleander caterpillars cause damage, but they can be controlled with non-chemical pesticides. Trees that aren’t native to Clearwater are often the most difficult to maintain. For trees that will grow and thrive, choose trees that are perfectly adapted to the current environment.